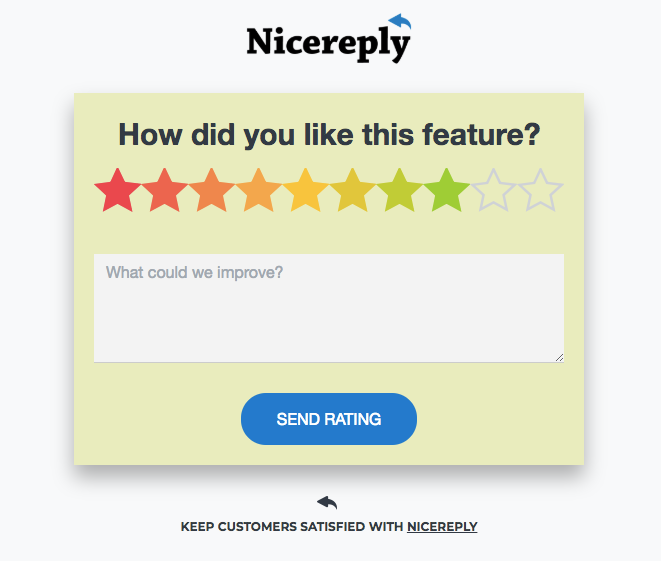 There are multiple rating scales available in Nicereply for your company to use. 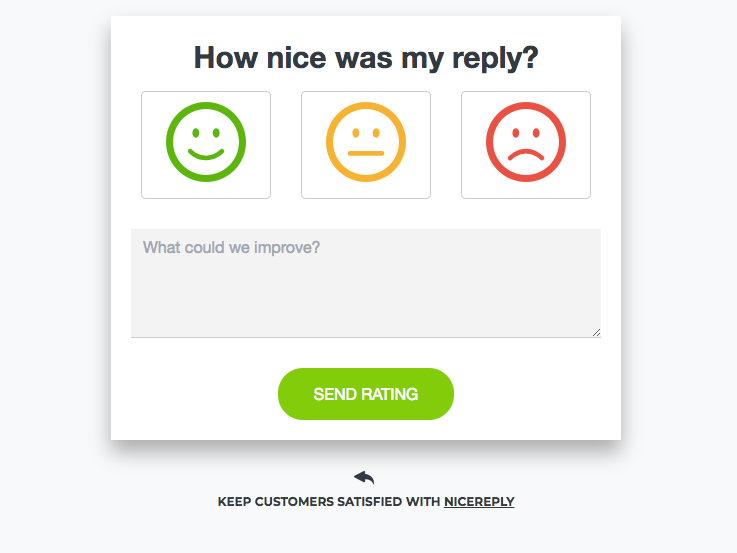 Nicereply offers 3 proven methodologies based on proper scientific research - CSAT, CES 2.0 and NPS. 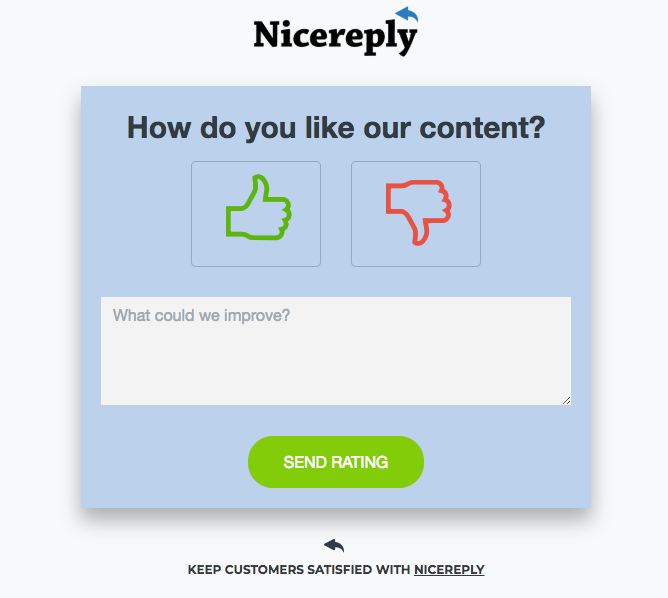 This article will provide you basic overview of rating scales provided by Nicereply one-click survey solution. Measuring customer satisfaction means having a better idea of what works to keep customers satisfied – and what leaves them unhappy. This way you’ll know what to keep up and what to fix. You’ll also be able to gauge the performance of not just support generally, but specific teams and individuals as well. Customers will receive a survey asking if they were happy or satisfied with the service they received, which they can respond positively or negatively to. The customer chooses their response on a scale from bad (or not satisfied) to good (or satisfied). You can send out an email with a survey after a ticket is closed, or you can measure CSAT in every email interaction with your customers in the form of “instant ratings”. Survey itself can have many different looks. Nicereply CSAT surveys usually look like 3 smileys portraying different emotions, 2 hand with fingers facing upward or downwards or a scale of 10 stars. PRO TIP: To find additional CSAT rating styles - Thumbs and Stars - go to your Nicereply account > click CSAT > Survey > click Appearance on the survey you want to edit > move your mouse over the smiley faces > click Edit > you will see Thumbs and Stars option on the right side. The idea of CES is that customers enjoy doing business with companies, that are easy to work with. CES measures the amount of effort customers had to exert when dealing with your company. CES is measured by surveying customers after the resolution of their conversation (usually 24 hours after a ticket is closed). Customers are asked to rate the statement: “The *|COMPANY|* made it easy for me to handle my issue.” on a 1 (low) – 7 (high) scale indicating whether they agree or disagree with the statement. Being based off of a research paper by CEB, CES survey will always ask the same question. Original CES used a scale of 5 different answers, while the updated CES 2.0 uses a scale of 7. NPS brings a simple solution to finding out who trusts in your brand and why. You can use this knowledge to enhance your customer service, but it can also be used by your marketing department to gauge your customers feeling toward your product. The NPS survey asks customers “How likely are you to recommend *|COMPANY|* to a friend or colleague?” and they respond on a scale from 1 (very unlikely) to 10 (very likely). Customers who answer lower than 6 are a detractors, while those who respond with a 9 or higher are a promoters. Customers responding 7-8 are passives. Due to it being based on a research by Bain & Co, NPS survey will always look the same—a scale from 0 to 10. The question itself can vary slightly. One such example could be a question “On a scale from 1-10, how likely are you to recommend this organization as a good place to work?”—this is also known as Employee Net Promoter Score.